Thanks to Andrea Carroz and Erica Hernandez, who are providing another guest post about setting up your LinkedIn profile. In our previous post on LinkedIn, 9 steps for creating your LinkedIn profile, we hope we demystified the world of LinkedIn and that you created a LinkedIn profile. Now we want to share some tips on taking that profile to the next level. Our tips will help anyone who is creating a LinkedIn profile, but out tips especially are helpful for college students, who typically don’t have too much work experience – or work experience that directly is related to their job field. Like any other social networking site, LinkedIn offers a variety of extras that can help round out your profile and offer even more of an insight into who you are – in a professional way. Here are a few of what we feel are the most beneficial extras to add to your profile. 1. Courses can help fill experience void. LinkedIn recently released an update to its site, which included extensive courses listings. This option provides students the chance to list any courses they have taken. The courses you’ve taken can demonstrate the skills that you have that won’t be obvious by just your major or a list of part-time jobs. If you have taken a course that is related to the job you are seeking, add it! If you’re a journalism student that has taken Multimedia Writing, Reporting and Advanced Photojournalism, list the course titles in that section. If you are a mechanical/aerospace engineer major and have taken Thermodynamic and Aerospace Research, add those courses. But don’t overdo it. Future employers do not need to see every general education biology or history class you have taken. Choose the classes you list with a critical eye. 2. Taking your job descriptions from OK to better. 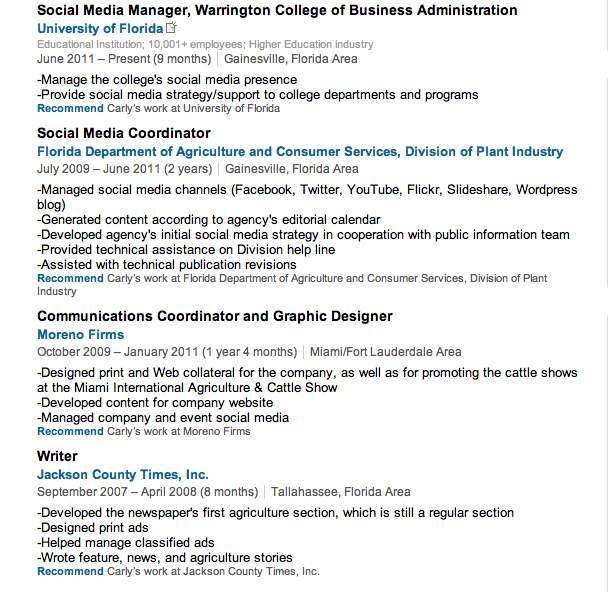 Job descriptions are meant to be concise in resumes, but in LinkedIn, you can add details to the jobs you’ve held. Although you should not make your job descriptions into essays, you still have a chance to give more details. Include special projects you contributed to, initiatives you were involved with, changes you helped enact, challenges you helped resolve and how those made the company better off. Show recruiters that you would be an asset to the organization through your teamwork, ability to solve problems, etc. Descriptions must be well written, descriptive and concise. 3. Showing professional interests by joining groups. Like Facebook, LinkedIn has accounts for organizations and interest groups. Joining groups can be a great way to make connections (a topic we will look at in greater detail in a future blog post). Being a part of organizations and interest groups also shows your personality and humanize your profile somewhat. For example, if you are an avid volunteer with Habitat for Humanity, add yourself to that group. If you are a support of PETA, join that group. Showing those involvements is helpful for when you make it to the interview stage, as employers will have more to ask you about than just your work experiences or coursework. Once you find a group that you are interested in, click the ‘join group’ tab. You will be directed to a page where you have the option of sending a message requesting to join the group. This is not necessary, but it is always a good idea and it gives you a higher chance of being added to the group. Word of the wise: Do not treat these groups like those on Facebook. Remember to stay professional. Engage in professional conversation, development, and networking within these groups. These three simple steps are of special importance to college students who often don’t have work experience in the field. These areas are the places where your ability, personality and other interests are able to shine. We’ll be making another post that will provide tips on how to make appropriate connections and LinkedIn connection etiquette.